Gru: Good night, sleep tight. Don’t let the bed bugs bite … because there are literally thousands of them … and there’s probably something in your closet too. You’ve gotta love an imagined world where there are evil super villains lurking around stealing things like pyramids and what not right from under the world’s noses. Arguably, super villains exist in our world but the consequences of their dastardly plots are little too real for me. Someone who wants to shrink the moon and hold it ransom though so he can be the biggest, baddest super villain in the world though – now that’s my kinda guy. Or at least he would be if he weren’t trapped in such a predictable, hollow plot and bogged down by such tired, unfunny dialogue. Gru is despicable. As he is the center of his own universe, from his point of view, he is DESPICABLE ME. 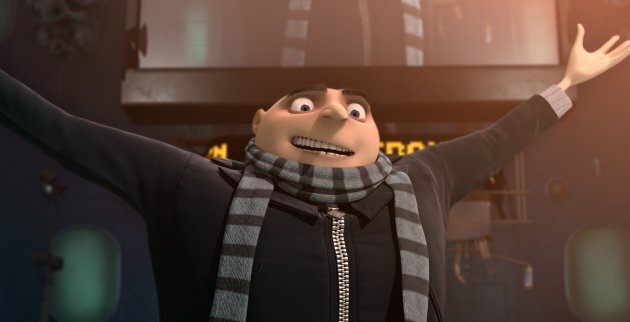 Voiced with a pretty sturdy Russian American accent by Steve Carrell, Gru is so evil he pops kids’ balloons after he blows them up for them (gasp!) and freezes the long line of people waiting for their lattes at a local coffee shop so he can go to the front of the line. I’m shaking in fear here. What he does next is actually pretty gross when you think about it. He adopts three little girls so that they can bring a shipment of cookies to his new nemesis, Vector, who is evil with “both direction and magnitude” and voiced delightfully by Jason Segel. The cookies are really robots though and are designed to steal the shrink ray Gru needs for his moon heist. In a not at all surprising turn of events, Gru, a man who is supposed to embody evil, finds himself caring for these adorable little girls. When the girls’ dance recital poses a conflict with his moon heist, you can almost piece together every little lesson still to be learned. Family films do not have to be complex or present a true face of evil to make their point but they have to try a little harder than this to remain original. 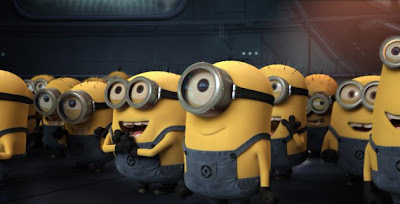 Instead, DESPICABLE ME almost ends up living up to its name and leaves you with little more than a few funny moments and some pretty awesome little minion characters. Those guys made the movie! Too bad it wasn’t about them. such a cute, and funny movie. i really enjoyed this one. 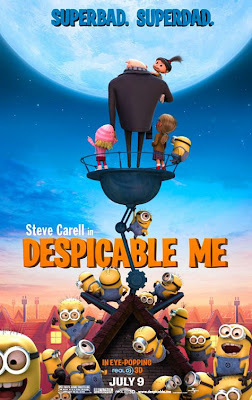 The plot of Despicable Me has enough twists and turns to keep things interesting, and the antics of the minions provide a nice side of fun to the proceedings. Also, their reaching contest during the credits is a fun use of 3-D that had the kids in the theater reaching for the screen. I did think there were plenty of cute moments in this film and the 3D was also certainly effective but it is just a bunch of moments for me and nothing more. Anything resembling plot was predictable, thin and tired. A supposedly despicable person learning to love is a little too easy for me.